The Iowa City Public Library is now offering streaming movies from Kanopy. All you need is a Library card and to be a resident of Iowa City, Hills, Lone Tree, University Heights, or rural Johnson County. Kanopy set up is easy. Go to http://icpl.kanopy.com to get started. Now you can click on a movie and start watching! I read a lot of Star Wars comics. A lot. I blogged in the past about my favorite title, Star Wars: Darth Vader, which ended in 2016. Star Wars: Doctor Aphra is a sequel of sorts. Doctor Aphra is a character who was introduced in Star Wars: Darth Vader, and Star Wars: Doctor Aphra takes place after the end of that series. Doctor Aphra is an archaeologist who worked for Darth Vader (before he tried to kill her). Aphra brings along the supporting cast from Star Wars: Darth Vader–two assassin droids, Beetee and Triple-Zero (my favorites!) and Black Krrsantan, a Wookiee bounty hunter. In this first volume, we learn more about Aphra’s history and meet some people from her past. Also, Aphra owes just about everyone money, and there’s a lot of double-crossing. She’s just a woman trying to make her way in the galaxy, you know? 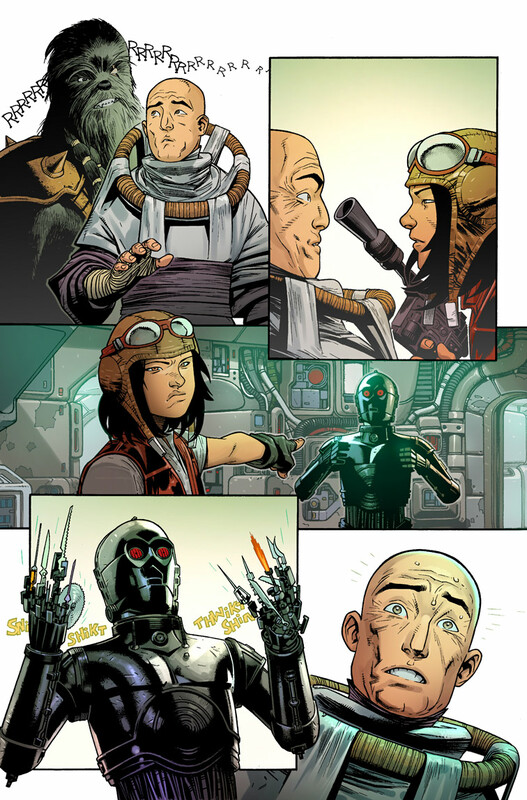 It’s hard to introduce an original character into the Star Wars universe and have them fit naturally, but writer Kieron Gillen did a phenomenal job of creating one in Aphra. She’s anti-hero that you can’t help but love. Seriously, give her a spin-off movie or something. I really dig Kev Walker’s art in it too. Star Wars: Doctor Aphra is an easy recommendation for someone who read and liked Star Wars: Darth Vader. I’d recommend both titles to any Star Wars fan! Families with babies and owners of dogs rejoice! It is now illegal to use of fireworks inside the city limits of Iowa City. Some fun folks like to ring in the New Year with a Roman candle or two. If someone does, call the Iowa City Police Department at 319-356-6800. Please be ready to provide an address or vehicle description. It is a minimum $250 fine for anyone caught using fireworks inside city limits. On October 17, 2017, Electronic Arts, the largest video game publisher in the industry, announced that it was canceling a highly anticipated Star Wars game and shutting down the developer that had been making it, Visceral Games. This caused waves with fans, including me, because the brief, early footage of the game had been tantalizing. Everyone wanted to know what happened. Why was such a sure thing called off? Luckily, a couple weeks later, Jason Schreier, a journalist for Kotaku, published The Collapse Of Visceral’s Ambitious Star Wars Game. Schreier spent time with the former employees of Visceral Games, and they described a game doomed from the beginning. It was a fascinating article that gave a glimpse into the making of video games that I hadn’t really considered. At the end of the article, I wanted more, and Schreier mentioned that he had written an entire book about the topic. So, I went and immediately checked out Blood, Sweat, and Pixels. Blood, Sweat, and Pixels details the development of nine popular video games and one game that was never released. The commonality is that the games are made by people who are passionate about their jobs, but who have to sacrifice their health and personal lives to work hours upon hours of brutal overtime to finish products. Also, that games are never really finished, just released. Honestly, after reading this book, I’m surprised that video games get made at all, let alone that some of them are incredibly entertaining. Scherier’s writing is straightforward–you can tell that he’s a journalist–and very readable. The background that he gives on games that I have played, like Destiny, gave new texture to the experience, and it’s a testament to Scherier’s writing that I was engaged during chapters about games that I’ve never played, like Uncharted 4. I now want to play several of the games featured in this book, but, alas, my time for playing games is limited. Overall, the book is an eye-opening, behind-the-scenes look at an industry that doesn’t get serious attention paid to it. I highly recommend it to gamers and to people interested in making games themselves. Field of Screams–Haunted corn maze put on by the Johnson County Jaycees. Dates & Times: October 13, 14, 20, 21, 27 & 28. Open at 7:30 PM. Last visitor in line at 10:30 PM. Closes at 11:00 PM. Admission: $10 per person ($1 off admission, if you bring a canned food item). CAB Haunted House–The Iowa Memorial Union is turned into a free haunted house. Dates & Times: October 13, 14, 20, 21, 27 & 28 from 7 PM to 10 PM. Admission: $20 for two attractions. $30 for four attractions. You probably don’t need any encouragement to read a Neil Gaiman book. They are treats to be savored, and, honestly, Gaiman writing about Norse mythology is a bit of a no-brainer. Like peanut butter and chocolate together. If you’re on the fence at all, though, let me tell you this: I liked it even MORE than I was expecting to. Norse Mythology has Neil Gaiman retelling the tales of Odin, Thor and Loki that he fell in love with in his youth. Gaiman was introduced to the characters the same way that I was–from reading the Thor Marvel Comics. I was astonished by how different the characters were from their comic book counterparts. These are self-absorbed, competitive, and temperamental gods, but strangely likable. It was always amusing to hear that Loki was Thor’s first suspect when any mischief occurred. Actually, I was surprised by how humorous the stories were in general. I found myself laughing out loud at the god’s shenanigans and Gaiman’s witty writing. We get 15 separate stories that, when you read them all, feel like an adventure or journey with old friends. The stories are told roughly in chronological order and flow into each other well. He begins with the creation myth which was my least favorite. I need characters and relationships. Once those were introduced, there wasn’t a single tale that was a miss. The stories culminate in Ragnarok: The end of all things, but there’s beauty in the destruction. There’s rebirth and hope and the promise of new tales. I listened to half of the book as a Book on Disc. Gaiman reads it himself, and his voice adds magic. One of my favorite reads of the year. Sometimes I feel the inescapable need for some Science Fiction with star ships, other planets–the whole bit. Luckily, The Collapsing Empire, by John Scalzi scratched that particular itch, though it presented me with a different problem: It ended way too soon. The Collapsing Empire is the beginning of a smart, new series and an introduction to a massive new universe. In the future, humanity has spread out among the stars with Earth long forgotten. We’ve achieved faster than light travel through The Flow, a field that can transport ships through space to different parts of the universe. What holds humanity together is the Interdependency, an empire built around trade and, well, interdependence. The book follows three point of view characters– a scientist who studies The Flow, a merchant on a starship and the new Empress of the Interdependency. Each of them becomes aware of changes with The Flow, and they each know that these changes are trouble and threaten the Interdependency and life itself. To me, The Collapsing Empire felt like a modern Dune with it’s sprawling universe and political machinations. It also reminded me of Game of Thrones because of its multiple point of view characters. The author, John Scalzi, is very…I don’t know, SCALZI-ish? He’s definitely an author where you’re either going to like him and his style or you’re going to go somewhere else for your spaceship fix. I loved the book and am eagerly awaiting the next installment. Raise a Glass to Freedom…Voting Resources!